Singapore is an amazing melting pot of food all over the world. Many of us have tried Spanish paella, Indian curries and Korean bibimbap. But have you tried Sarawak laksa before? I had the opportunity to interview Roy Ong, the hawkerpreneur behind Bukit Merah Hawker Centre’s famous Sarawak laksa, and learnt how much sweat, blood and tears had gone into making this dish. Roy grew up as the second child in a family of four children. Since young, he would help his mum out in the kitchen to cook for his family. As a teenager, he worked in a tze char restaurant to earn some pocket money. However, when Roy entered the workforce, he joined the logistics industry, which would make up the bulk of his career. Working as a delivery subcontractor to beverage manufacturers in Singapore, he was able to make a decent living delivering their products from factory to retail outlets. But as he grew older, he faced increasing competition from cheaper foreign labour, and realised that staying in this industry would not be a good idea as contracts would increasingly be harder to secure due to cheap-sourcing. By 2015, he exited the logistics industry to search for his second career. How did Hawker Roy enter the hawker trade? Roy decided to return to his love of cooking, and took half a year to nail down the cuisine he wanted to bring to Singapore. Roy’s best buddy, Wayne, is a Singaporean who frequents Sarawak for work regularly over the past 9 years. Wayne introduced Roy to Sarawak cuisine and took him to different states of Sarawak to try out the local food. 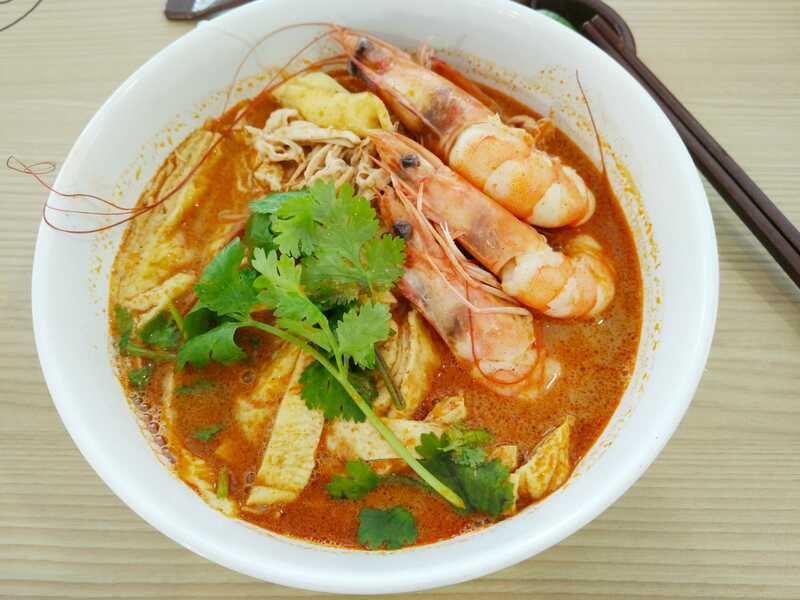 After Roy came back to Singapore with some cooking tips on Sarawak laksa, he took the effort to create a recipe palatable to Singaporeans’ taste buds via food tasting sessions with friends and family. As a result of adapting his recipe to local tastes, his Sarawak laksa is less oily and less spicy than the original Sarawak laksa. With further R&D, Roy also developed his own version of bak chor mee, pig trotters and Sarawak kolo mee, importing the kolo mee noodles from Malaysia which have a more chewy texture. 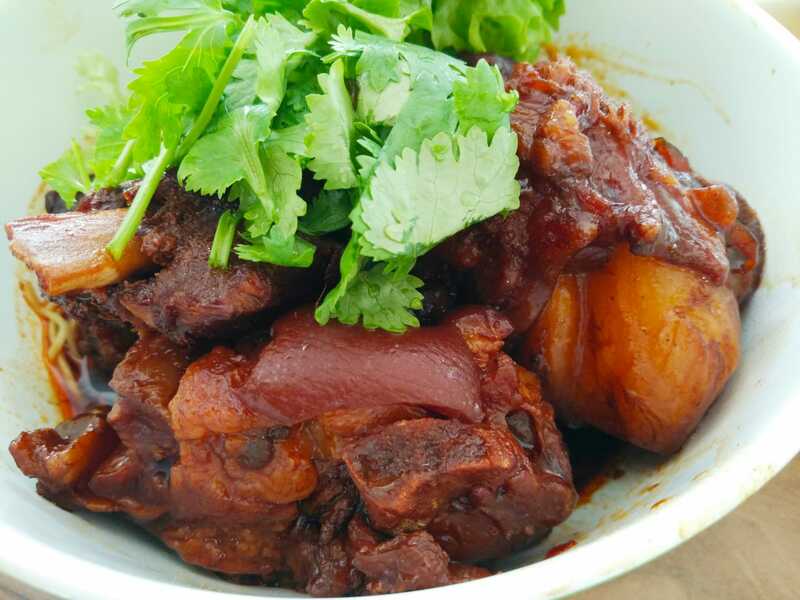 Roy’s pig trotter with noodles/rice ($5.50) comes with three stewed pig trotters. This is my favourite dish. 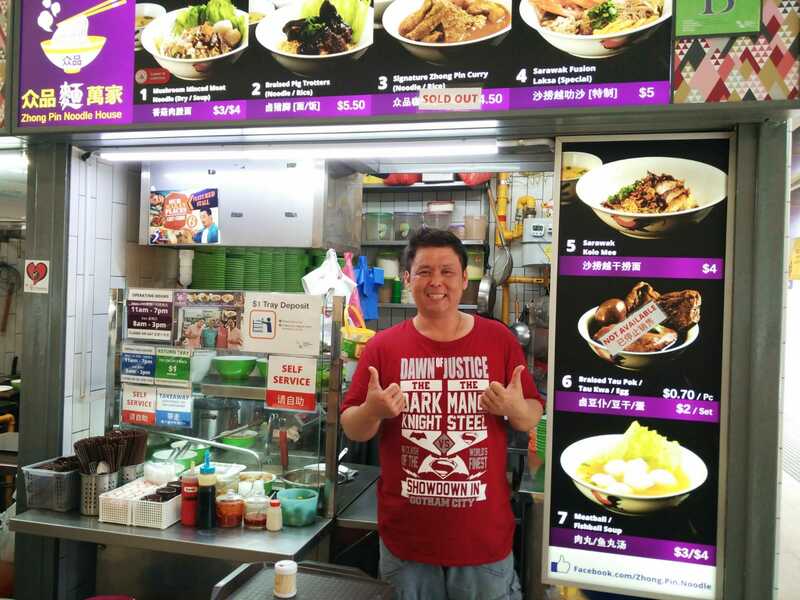 In 2015, Roy started Zhong Pin Noodle House at Bukit Timah Hawker Centre after two unsuccessful bids with NEA, the second of which he bid $3,800. It was difficult getting the patrons to try his dishes as they tended to stick to the regular stalls they frequented, and his brand was so new that it needed time to build up awareness and a regular customer base. 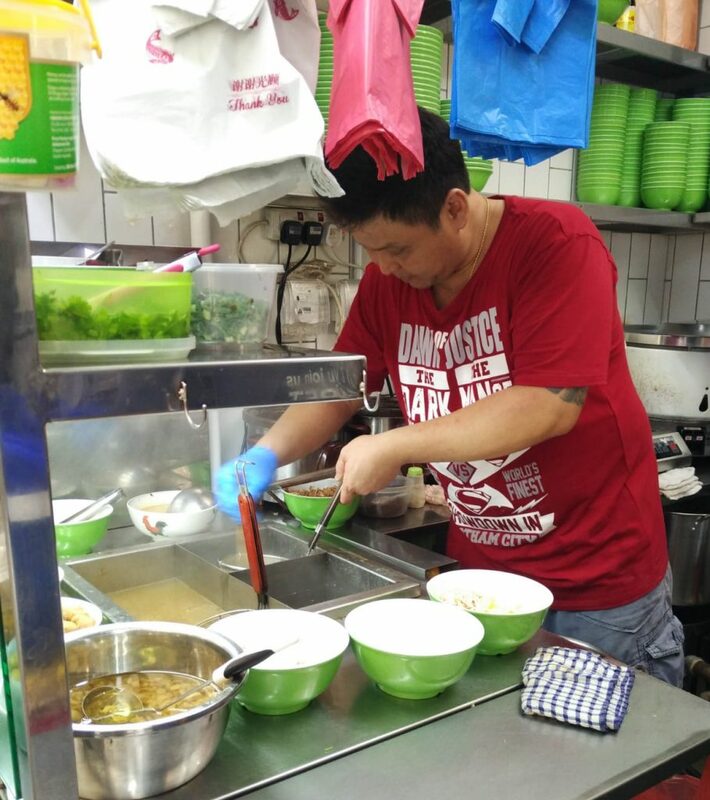 After two years of struggling, Roy decided to relocate his stall to Bukit Merah Hawker Centre which was slated to undergo renovation. In the six months he waited for renovations to complete, he took two courses, a WSQ Certificate and also an Advanced Certificate in Culinary Arts (Asian Cuisine) to upgrade himself and network with the culinary community. The renovations took longer than expected, but he didn’t waste time. With more R&D, he added a curry dish and meatball/fishball soup to his menu and continued to improve the taste of his existing dishes. Although hawkers are self-employed, this doesn’t mean they can work short hours and chill during the rest of the day. There is a lot of preparation and cleaning up to do that people may not notice. Roy wakes up and washes up to leave home within 15 minutes. He drives to a nearby wet market to handpick fresh prawns for his signature Sarawak laksa dish. Roy reaches his hawker stall at Bukit Merah and spends a few hours preparing the ingredients for his dishes. Roy opens his stall for business, catching the lunch and early dinner crowds. Working as a hawker is almost non-stop action for Roy, who also hires a stall assistant and a friendly aunty cashier who works part-time over lunch. During off-peak hours, Roy starts preparing the soup stock and marinating ingredients like char siew and pig’s trotter for the next day. His laksa and soups (not the typical MSG soup) are brewed for several hours using fresh ingredients like chicken and pork bones. After a long hectic day of cooking, work doesn’t end. It’s time for Roy to wash up and clean the stall. This takes about one and a half hours. Finally, Roy has time to eat dinner with his wife. Reach home, wash up and rest. Roy opens his stall on Mondays to Fridays from 11 am to 7 pm, and Sundays from 8 am to 3 pm. He rests on Saturdays. One thing many people don’t realise about being a hawker is that it isn’t as simple as opening a stall with a snap of the fingers. Curious about the various costs that hawkers have to pay, I enquired how much Roy had to fork out to set up and run his hawker stall. *Roy bought the stall (aka transfer name) from the previous owner in order to get the same rental price as other older stall owners before NEA took over from HDB. Hence, he avoided the bidding competition to save on rental costs. Roy is also on the lookout for opportunities to improve productivity, and tap on NEA’s Hawkers Productivity Grant which allows hawkers to claim 80% of the equipment unit cost, capped at $5,000 over three years. As of now however, the equipment on the pre-approved list does not fit his stall’s needs, or simply doesn’t fit into his small stall. What are Hawker Roy’s dreams? Nevertheless, Roy continues to serve his customers food cooked from the heart, and offer affordable eats like $3 bak chor mee even though it is not a profit-making dish. Roy is happy when customers appreciate the food he cooks, and is open to feedback how to improve his dishes. He dreams of expanding his business (more variety, and more locations) in the future. Till then, you can find him at his stall, Zhong Pin Noodle House, whipping up a bowl of Sarawak laksa. Special thanks to hawkerpreneur Roy Ong and his wife, Xan Tan, of Zhong Pin Noodle House for arranging the interview.